The purpose of this study is to analyze learning effectiveness when students are in training to review the design of concrete structures. Two different course delivery methods for vocational engineering students are compared. The first delivery method begins with a traditional instructional approach followed by an active learning approach. The second delivery method utilizes the same approaches, but in reversed order. The difference in learning effectiveness of the two approaches is analyzed, based on a semi-quasi pre-test/post-test experiment design with an experimental group (first hands-on, then theory) and a control group (first theory, then hands-on). Based on 30 test questions and difference scores between pre-test and two post-tests, as well as statistical significance and effect size, the learning effectiveness is determined. 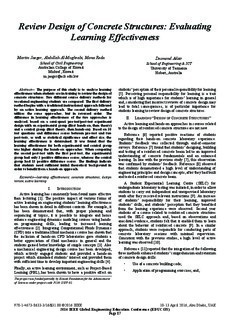 It was found that the learning effectiveness for both experimental and control group was higher during the hands-on approaches. When comparing the second post-test with the first post-test, the experimental group had only 2 positive difference scores, whereas the control group had 13 positive difference scores. The findings indicate that students need sufficient initial theoretical background in order to benefit from a hands-on approach.